The ploughman’s lunch. ‘Tis a little known phenomenon here in the US, but back across the pond in England, this simple but hearty meal is alive and well in pubs and taverns of all shapes and sizes. A traditional ploughman’s lunch is nothing more and nothing less than a nice wedge (or two!) of cheese (usually Stilton or Cheddar) an equally fortifying hunk of hearty bread, some ‘pickle’ (the Brits’ charming word for chutney or relish) some minimally invasive fruit or veg, and, of course, a pint. Upon doing a bit of research about the history of the ploughman’s lunch (I was picturing field hands, paused under a tree after a morning of threshing, planting, or plowing, unpacking their wares and chowing down) I discovered that the meal most likely was created by the English Country Cheese Council in the 1960’s as a way to try and cajole their countrymen into eating more cheese. Which pretty much popped the bucolic bubble floating around in my imagination. However, no matter what the provenance of the phrase, the meal is a stroke of genius. And, I would wager, a much safer bet gastronomically than some of those other pies and pub concoctions. A few weeks ago, I found myself in a little pub in Oxford tucking into a sturdy ploughman’s lunch, and commenced feeling a bit evangelical about it. Though Saxelby Cheesemongers is no pub, upon my return to the States we quickly got to work on our own version of the ploughman’s lunch in sandwich form. Saxelby Cheesemongers ploughman’s sandwich features Shelburne Farm’s two-year cheddar on a Sullivan Street ciabatta, liberally slathered with Sweet Deliverance spicy green tomato chutney. It’s a cheese & chutney match made in heaven if we do say so ourselves! Come on by the shop this week and snarf a hearty ploughman’s sandwich! Sadly, we have to serve it minus the pint. But if you’re jonesing for the true pub experience, you could always pack it up and hoof it on over to d.b.a on 1st Avenue for a little backyard cheese and beer picnic! 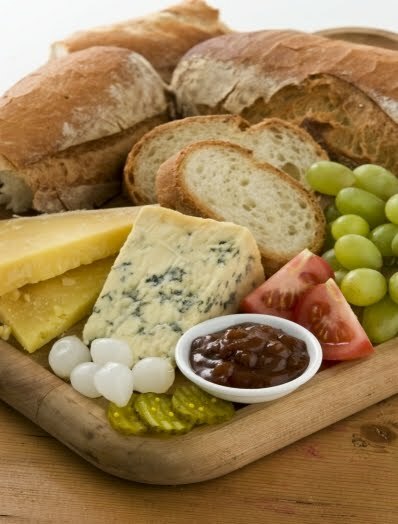 … the meal most likely was created by the English Country Cheese Council in the 1960s …No, bread, cheese and beer had been around as a lunchtime combination for centuries, all the Cheese Bureau marketeers did in 1957 was give it the name "ploughman's lunch" – see here.